Tired of not seeing results from your website? Is your website simply not growing your business to the degree you want (… or need) it to? Well, real estate websites aren’t exactly rare. There are more than two million real estate agents in the United States. Largely speaking, most agents have a website, do something on social media and have attempted SEO. These tactics can and do work. But we can all name a competitor who has such a head start on us that catching up seems unlikely. This makes it challenging to drive significant traffic to your website. Why are Facebook ads a solution? Facebook ads are cheaper and more effective than Google Adwords the majority of the time. Facebook ads also get you results in a shorter period of time than SEO, social media and organic methods. This means you can ultimately get more leads for less time and money. Set up correctly, Facebook ads can dramatically drive your business. We use them at Easy Agent Pro and spend a fraction of what we would have spent on Google Adwords. And they provide quicker results than our SEO, social media and other organic marketing methods. Today, you’re going to learn how to set up highly profitable Facebook ads that you can use to scale your marketing to the moon. PRO TIP: After mastering Facebook Ads, launch Bing and Yahoo advertising; the cost-per-click is typically 50 percent less that Google Adwords. Let’s start with an analogy: You’re driving down a completely empty highway in the middle of New Mexico. One mile after you pass the state penitentiary you see a hitchhiker on the side of the road. Do you give them a ride? Of course not! Now, imagine you are picking up your kid from school, and they ask if this new friend of theirs can carpool home with you. Do you give them a ride? Of course! Your website has to act as a trusted referral source between you and your visitors. You must do this before sending paid traffic to your site, or your paid traffic will fail to convert. People don’t pick up convicts from the side of the road, and they don’t give their contact information to shady-looking websites. If you don’t do this first step, you will pay two or three times more per lead than someone who does. We all know millions of advertising dollars are spent to split-test headlines. But how many of us have actually done this in our own business? Not many. It’s one of those things we naturally put off. So, here is an easy way to test all your content headlines right now. This will make sure people love what you’ve written. Plus, you’ll be doing this for next to free! We will use these articles to advertise on Facebook and ultimately get people to give us their contact information. 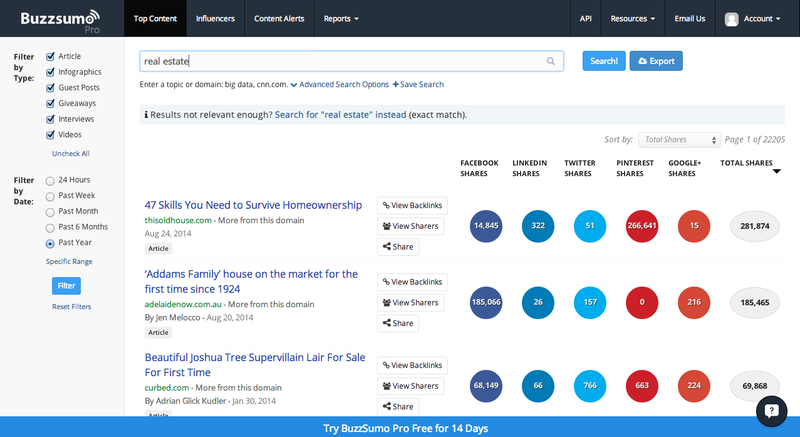 You’ll find the most popular real estate articles or articles about your city on the web instantly. This website shows you the articles that have been shared the most on social media. This generally means something about that title makes people want to read it. Now you have your list of titles! The rest is easy. Pick 11 of these articles and start writing content that is slightly better. The three ways to do this are to make the article longer, make it more up-to-date,or make the graphics better. I suggest doing all three! Each blog also needs a graphic element. There is very little correlation between what people read online and what they share. One of the biggest drivers of sharable content is the featured image. You really want to splurge on great graphics for your articles. You can order some graphics for $5 off of a site like fiverr.com or 99designs. Be sure to look for someone offering “flat design” who also has plenty of reviews. Making infographics for your data-based articles is also a great idea. I bought this one for less than $100, and it has been shared frequently. The second thing you need to build trust on your website is client reviews. Make sure that any page where you’re asking for an email address or contact information has the best reviews on it. This will dramatically help your conversions. The goal of your Facebook ads should be to add contacts to your email list. Email drip campaigns and blasts are still the cheapest and most effective ways of selling online. Yes, the ads will target traffic who wants to do business with us right now. But you really want to capture both the traffic from people who want to buy immediately as well as those who aren’t quite ready. I recommend that you have three types of email capture systems setup on your website. Each capture offers a different article that you wrote in the step above in exchange for the contact information. Make sure you have both a drip email sequence and email blasts set up for these new contacts you’ll be getting. Check back later this week for part two in the series, when I’ll explain how to tailor your Facebook ads specifically for Realtors.